District 5040 is very proud to welcome our new members, those who have recently joined one of the 48 clubs within our District to our Rotary family. Thank you for joining us and we feel very fortunate to have your enthusiasm and expertise. No doubt you are getting to know your club. We encourage to participate and get to know your fellow members. We hope you will not wait to get involved. We need all the help we can get both locally and internationally. Rotary is fun and it gives you a great vehicle to make a difference but sometimes it can be a little intimidating. Be sure to engage, your mentor plus other members of your Club. They are great guides and will help you get started. Rotary is much larger family than just your Club and the cliche is true. We actually are " a global community of more than 1.2 million men and women dedicated to building a better world". We encourage you to get out there: Exchange Ideas and Take Action. There are many Rotary activities, resources and people who will make your Rotary experience much more rewarding and fun. How did Rotary find you? Thanks to all who answered our questions. Your answers are very insightful and good reminders to those of us who have been around awhile on why we joined Rotary. I like what Rotary does in our community and worldwide. I transferred to the Pemberton Club because I liked what the Club does internationally and because it fits into what I want to do. in terms of community service. I am excited about Rotary because it is an international organization with a global reach making it easy to help people through every small club in countries like Africa, India. My passion is technology which educates people. Small clubs have a lot of energy and experience on the ground enabling them to be effective. Why did I join Rotary? To get involved with the community, meet new people and network. What excites me about Rotary? When I was visiting Playa del Carmen, I had the pleasure to attend a meeting down there. It was exciting to me that everyone was so nice and welcoming. There were actually two other member visiting from England there as well. All the work they have done and how each member was excited to explain to me what their club has done in their community really excited me. It fantastic that you can travel over the world and have a nice place to come and connect with others that have the same views as you. I researched a bunch on what Rotary does to be sure I know what type of organization it was. When I felt I knew enough about it, I emailed the president Sean and we talked via email about what was going on in the Powell River club. It interested me on everything they stood for. I has a pleasure of sitting beside a long time Rotarian on my first visit as a guest and the information he told me was very interesting, I couldn't not become apart of this great community of people. Peter, who is a friend of longtime club member, Kalvinder Mahal, joined Rotary for the fellowship and the opportunity to serve the community. Marina is a director of a remarkable charity, Third World Eye Care Society, that has provided glasses for thousands of needy clients in third world countries. After a few years away, Murray re-joined the Rotary Club of Whistler as a very active member. He is the club’s webmaster and has recently become the District 5040 webmaster. Welcome back, Murray! 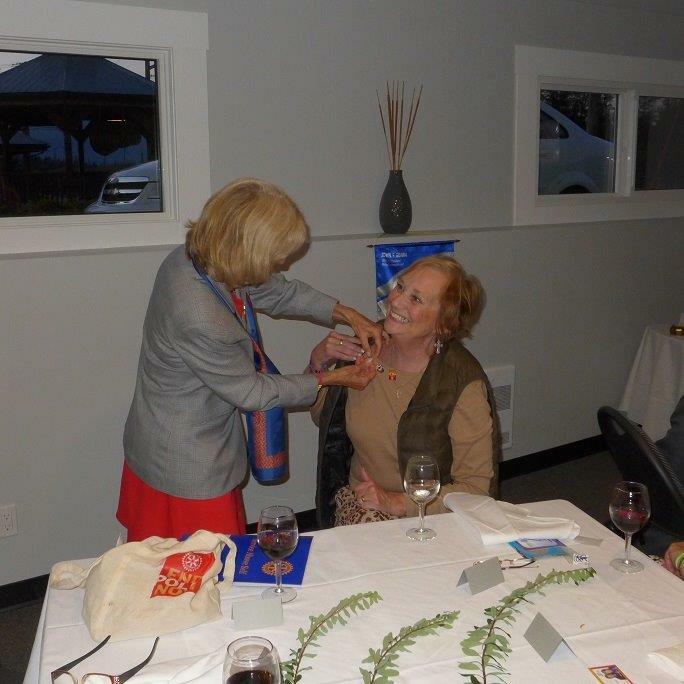 Dona loved serving as a Rotarian in previous clubs and couldn't wait to join the Rotary Club of Kitimat. I was seeking to join a group of caring, generous, and compassionate people who are making a positive difference in the world and this is what I’ve discovered in Rotary. I am interested in joining the Rotary Club as I am beginning to have some time on my hands as my children get older and don’t need to chauffeur as much. I want to get more engaged with my community and the people in it. I am interested in helping youth and those in poverty. I also want to volunteer for fundraising activities.